I took the day off work yesterday, not because I’m sick, although I am, but because somebody asked for my shift and I thought, “Why not?” But I felt vaguely guilty all day. I only work two days a week, so it’s absurd to take one of them off. I had the mildly panicky feeling that we had to have a really wonderful day to justify my idleness. We had to do important things, and get a lot done, and have a remarkably good time. We had to have a hundred-dollar-day, because that’s what I might have hoped to make at work. Well, we didn’t get much done, we didn’t have any great adventures or go anywhere exciting. Isaac never even got out of his pjs, and yet I wouldn’t have traded this day or the memory of this day for any amount of money. We don’t have many days off together, because I work on the weekends and our store is open and the boys are in school all week. So David took Malcolm up to the shop, and they learned how to use Malcolm’s new airbrush. And Isaac and I didn’t do much of anything. We built a lego tower. We sketched: he drew sea monsters, “in the mom style,” and I sketched him sketching. We shared a sliced pear and played a game with strange cards and shifting rules. And then he asked me if I like being a mom. “It is a home question.” I replied, “I shall have to lay myself open to such a catechist, and I am not sure that I am prepared to do it.” Of course I didn’t say that! I don’t even fully understand the meaning of the word catechist. But it is a home question, it gets to the very heart of everything, of me, of our home, of my life. Mr. Thornton’s answer is to the question “You are all striving for money. What do you want it for?” And Mr. Thornton was silent. Then he said, “I really don’t know. But money is not what I strive for.” “And what then?” And what then? Well, I told Isaac that I like being his mother, it’s the best thing in the world. And then he said he wanted to see what it felt like to take care of someone. He made me lie on the couch, close enough to Clio that I could pet her, which was an important part of the process. He got me two pillows and a glass of water. He tucked me in with two of the softest blankets imaginable. Then he “unbundled” my hair so I could sleep better. And he read to me from a book of strange facts, about a walrus that plays the flute, and an upside-down house, and a teddy bear made of gold with diamond eyes. He said, “Are you entertained? Are you entertained?” And then he was very quiet so that I would fall asleep. I didn’t sleep, but it seems as though I dreamed in flashes. And that was our afternoon. I suppose everybody needs to be taken care of sometimes, and often you don’t realize it until it comes from an unexpected place, until somebody makes you sit still for a moment. People raced by our house in the cold endless rain, and Clio sighed and groaned and refused to go into the yard. Towards evening when the rain slowed a pale greenish glow filled the sky and as the day ebbed it was as bright as it had been since morning. David and Malcolm came home. We made a good dinner, we went to a movie in the movie theater for the first time in ages. It was a good day, it was a home day, it’s what we strive for. I like after holidays when giant mushrooms go on sale. I used giant white mushrooms–stuffing mushrooms they call them, but you could easily use portobella instead. I stuffed them with a mixture of chopped pecans, chopped mushroom stems, chopped black beans, and grated smoked gouda and sharp cheddar. I got a new food processor for Christmas, and I’m chopping everything in sight! Watch out!! They were flavored with sage, thyme, and nutmeg. They took on a nice savory-sweet almost praline-y flavor once the pecans browned. Here’s My Baby Just Cares For Me, by Nina Simone. Pull the stem out of each mushroom and set it aside. Slash the mushrooms with a shallow asterix on the top, and place them stem-side up in a single layer on a baking tray. Pour the olive oil and balsamic over, and mix with your hands until everything is fairly well coated. Roast them until they turn brown, about half an hour or more, depending on their side. Turn them once or twice so they brown on top and bottom. They’ll release their juices and then absorb them again before they get nice and brown. Meanwhile, warm the tablespoon of olive oil in a large skillet over medium heat. Combine the shallot, garlic and herbs in a food processor and process until finely minced. Toss into the pan and stir and fry until the garlic starts to brown. Put the mushroom stems in a food processor and process once or twice to chop finely. (or chop them by hand). Add these to the skillet and stir and fry until the mushrooms start to brown. Put the beans in the food processor and process very briefly to just chop. Add these to the pan and stir and fry. Pour the wine in, and cook until it’s absorbed by the mushrooms. Scrape the bottom of the pan to incorporate all the nicely browned stuff. Process the pecans until they’re finely chopped, but not completely pulverized. In a large bowl mix together the mushroom mixture, the nuts, the cheeses, a pinch of nutmeg, salt, and lots and lots of freshly ground pepper. Spoon this mixture by heaping spoonfuls into the bottom of the mushroom where the stems used to be. Bake for another fifteen minutes or so until the top is browned and crispy-looking. 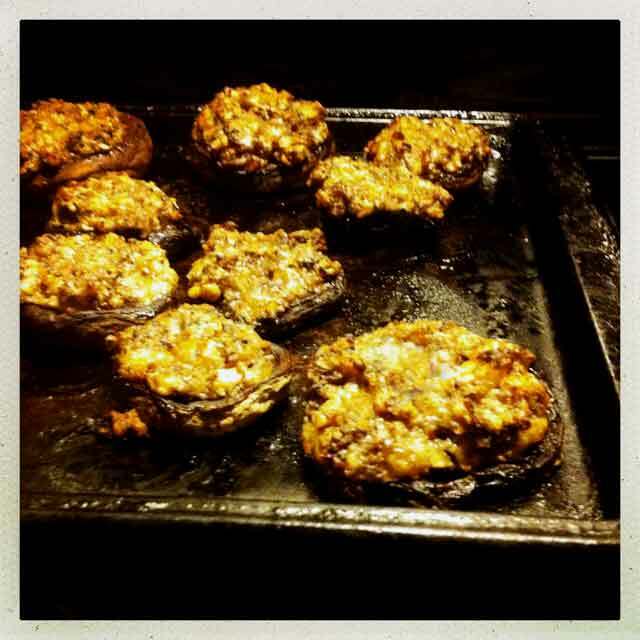 This entry was posted in beans, croquettes, mushrooms, recipe, Uncategorized and tagged black bean stuffed mushrooms, egg free, gluten free, pecan stuffed mushrooms, stuffed mushrooms by Claire. Bookmark the permalink.